I used to think that a buckle was the same thing as a cobbler, but it's really not. A cobbler has fruit in the bottom of the pan and topped with either a pie crust like topping, or more of a drop biscuit topping. And the fruit bubbles and thickens, but it stays separate from the topping. However, a buckle is more cake like. The fruit, blueberries in this case, are mixed into the batter, topped with a struessel topping and baked. 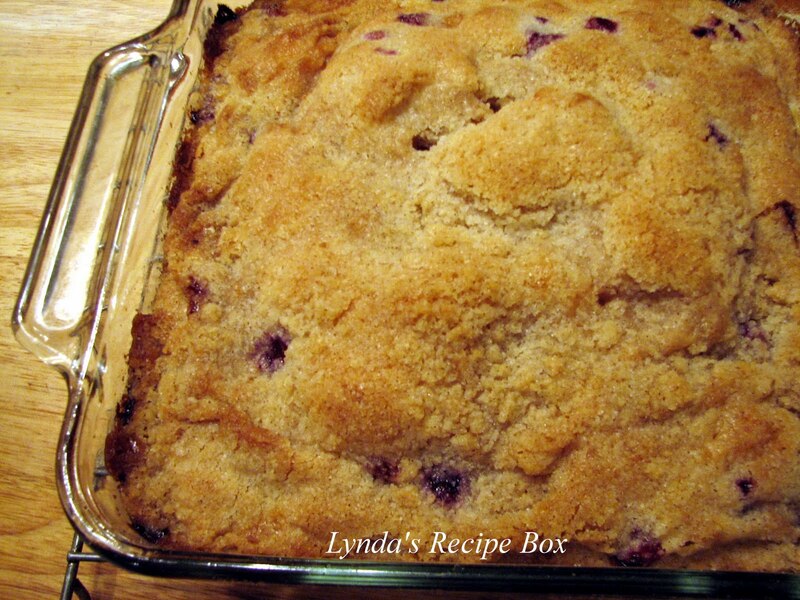 It's like a coffee cake, dense and moist with berries. It may get it's name because the top of the cake "buckles" as it cools. And it's very delicious! I did change the spices in this recipe because I love cinnamon best in the topping. 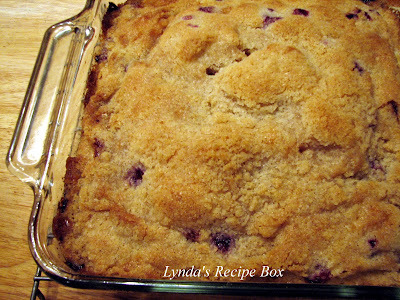 I've made this wonderful Blueberry Buckle several times and my husband and I can't get enough of it! The cake is tender but dense, and packed with blueberries, for an incredible addition to your morning coffee, or a sweet indulgence any time of day. Enjoy! Preheat the oven to 375 degrees. Spray a 9x9 inch glass baking dish with cooking spray. In a medium bowl whisk together the flour, salt, baking powder and ground nutmeg. Set aside. In a large bowl, beat the softened butter and the sugar together until creamy and fluffy. Add the egg and beat well. Add 1/3 of the flour mixture and 1/3 of the milk, and beat until incorporated. Repeat until the ingredients are combined. Gently stir in the blueberries and pour cake mixture into the prepared pan. In a small bowl combine the sugar, flour and cinnamon. Add the cold butter in chunks, and mix with a fork or pastry blender until there is a crumb-like mixture. Sprinkle the sugar mixture over the cake. Bake on the middle rack of the oven for about 35 minutes, or until golden. I tested with a tooth pick and my cake took about 45 minutes. Cool 10 minutes before serving. It's delicious warm or cold. Give it a try! Very nice and I'm positive delicious!! Gorgeous. Thanks for sharing such a lovely blueberry recipe. I am bookmarking it to try soon! buckle or cobbler..I love 'em both and yours look fantastic! Oh this looks and sounds amazing! I can't wait to try this and compare it to a blueberry pound cake I've been making. Thanks for sharing this! I need to use up my 22 cups of blueberries in my freezer! LOL. This looks like a wonderful recipe, Lynda. We have lots of blueberries in the markets now and I'm ready for a good blueberry cake. Love that streusel topping too. What I would give for a big slice right now. It looks FANTASTIC! and wow, this is beautiful. i love bleeding blueberries. Buckles, Cobblers, Crumbles, Crisps, Grunts...I love 'em all! And what's great is you can make them all year with seasonal fruits. Blueberries and raspberries are my choice right now. This looks wonderful, Lynda! Looks awesome, look at all those blueberries inside! This looks wonderful!! !Perfect for summer. Ha, I used to think the same thing until now. You just cleared that up for me, thanks. This really is a beauty! I wonder, can you make this same recipe with any oter fruits and have it turn out the same?I love blueberries, and am also partial to peaches, cherries, you name it. Whatever you call it, it looks super scrumptious! LOL I thought buckle and cobbler were the same, too. Well, I've learned something important here today. Thanks! And boy does this ever look GOOD!!! I am loving all that blueberry-ness (smacking my lips!). My husband is going to love this recipe! Blueberry Muffins are one of his favorite thing to eat so I know he will love this. Thanks! Ohh my lord that looks wonderful, I have a ton of Blueberries in my freezer! I've made this and it's very good. Alton's version with cake flour I bet is very tender. Your photo is lovely. PS I am having a $70 giveaway on my blog. I would love for you and all your readers to enter. Deadline is Sunday, July 25, Midnight. Yum, we love fruity desserts. I don't have blueberries but I do have some raspberries needing a home. Thanks for sharing! 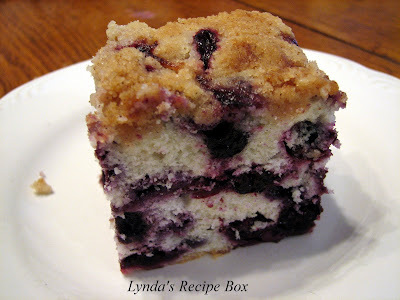 Lynda, I made this the other day and it was a HUGE hit at my house! It was gone so fast that I think I need to make it again real soon! :o) THX for an AWESOME recipe!! ** I posted it on my blog...go check it out! threeonfood.blogspot.com! Tara- I'm so glad your family loved this-it really doesn't last long does it! I need to make it again as I just found blueberries on sale at my store. Thanks for the comment! I made blueberry buckles, twenty years ago. I think it was the Pillsbury Bake Off recipe. It was good then and I am sure, it is good now. Thankyou Maddy for visiting; I hope you enjoy the stuffed peppers and the bluebery buckle. Out of this world! I used frozen blueberries and regular flour and doubled the topping, so good! So happy you liked this! It is still one of our favorites too. Thank you for leaving a comment and letting me know. Hello Lynda, congrats for your yummy blog. I found it via Nami (Just One Cookbook). Promised, your fantastic Coconut-cream-pie, Bacon-cheddar-chive scones and Blueberry buckle are soon to be tried. Living in Normandy (France), we do not have a lot of blueberries, but right now there are raspberries in the garden and, very soon, wild blackberries in the fields - they should go very well with it.